Max Lucado’s book Cast of Character is an interesting take on many of the most talked about people in the Bible. He puts into his own words the personas of each individual as well as their unique struggles and conquests over life diversities. Through it all God comes through for them and provides in ways that were not always considered. In short, in Faith they were willing to walk through fear and into Promise. I liked the premise of this book and found it to be somewhat entertaining. As always, Lucado’s unique voice is apparent from chapter to chapter. He enlightens us about the lives and personalities of the disciple’s and apostles as well as a multitude of other players throughout scripture. Max does well to paint the reader a picture of the human side of each and every one of them by portraying them as closely as he could to those of this age. As far as great reads I would have to say he misses the mark. I found it very difficult to get through the book and found it very easy to put down. There was nothing that grabbed me and caused me to yearn to read more. It was a book that I chose to read between books. Cast of Characters may be a better book for a biblical novice who is just opening their eyes and hearts. It would be a great tool to help a new reader grasp the implications of modern struggle by exhibiting the similarities and exhibit the realism of them in a light of modern days. Readers will find themselves and those they know in the characters discussed in this book making the biblical stories easier to relate to. Again, it is not that this is not a good book. It just was not the right book for me. There are many types of dreams and many different meanings associated with them. Some dreams are visions, others are messages meant to guide us and many times they are moments between realms where we are visited by an ascended loved one, Angel or Messenger. The Bible is loaded with scripture that had profound effects on the lives of those who experienced the messengers and interpreted the messages and visions that came forth from dreams. Understanding dreams is an important part of Being all that we are created to be. Join me and my guest Authors Elisa Velasquez and Jacob Israel for an incredible credible look at dreams. You may preview their books on Amazon.com via the “Look Inside” feature. As a teacher, writer, artist, pianist, and composer, her desire is to inspire, encourage, and open hearts and minds to spiritual enrichment. For over twenty years, she has challenged the religious community, by freely offering Truth and elevating spiritual life through the evocation of Spirit. Her latest book Your Dream Life: Learn the Basics of Dream Interpreting will show readers how to break down dreams, help journal dreams and understand the meanings of symbols, colors, and numbers within dreams. He is the National book award winning author of The Calling: a Voice in the Dead Woods, as well as a Lonestar Emmy, Telly, and N.R.B. award winning television writer and producer. His compelling writing style brings the reader along a fantastic journey that will dwell in their minds for eons. He is a man of great faith and family. Suffering from childhood at the hand of a debilitating disease initiated his quest for life’s meaning. The diligent study of many faiths presented him with a great truth. That Truth brought forth freedom and the realization that everything he endured played its part in creating who he would be. http://www.revolutionboston.com/ to listen on line. I noticed that people tend to define themselves by the material things they hold and only assume that others do the same. These things are all temporary; all will lose worth and fade away, but our connection to God is eternal and His economy will never fail. So many times; when I am so filled and excited about God working in my life people ask, “How much did you get paid?” They don’t comprehend the value of the joy I receive from the opportunities God has given me to spread the Word He has sown in my heart. They think in a little box, abundance of all kinds could only come hand to hand, deed for deed and quid pro quo, but I must always explain that God is my accountant, business manager and financial adviser. Often the things I do for the Kingdom have very little to do with the way I get paid. It usually comes through the back door and my back door needs to be a loading dock because the Gifts are tremendous! The other day I was involved in a conversation that started with me explaining that all things get taken care of in my life. God always provides for me and my family in one way or another. I decided to leave a job that was not a good fit for me. He asked what I was going to do to make a living and I answered, “Whatever God leads me to do.” He laughed and thought I was crazy. In his mind there is no God and only one way to be fruitful. Giving freely from your heart and using the Gift within to prosper was not included in his tiny package. I knew that my present position was no longer a good fit for me. The mission I had there was already finished. God was now answering my prayers and bringing me to my next opportunity to serve. What ever I told him in regards to this seemed to fall on deaf ears. It was not getting through the thick liner of his tiny box. His God was money and he had a firm belief that the only way to experience steady abundance was to work harder for it. My saying, “It is better to work smarter than harder” had a negative effect on the situation. Even my visual analogy of picking up a book with two hands verse trying to do the same by balancing it on a pen failed to convince him. Working with God is working smarter! When we tap into His energy abundance comes to us quickly and easily. He then pulled out a $100 bill and said, “This is what I believe in!” I responded, “Let me see that. What does this say?” It read “In God We Trust.” Most likely, the founding fathers never wanted us to forget that money should never be worshiped it must never be looked at as our god. Several days prior, after taking a week to reflect on where I was and where I wanted to be; I began to contemplate giving my notice. I would come to say this simple prayer. “Father, I thank you that you’re causing me to be in the right place at the right time. You are bringing wonderful financial opportunities my way. I know there are no limits to what you can do in our lives. I ask you today to find me a career that is a better fit for me and that will allow me to use my creative talents and abilities to prosper in all ways. I ask this in the name of Jesus. Amen.” Within a few days I was inspired to text a well know literary agent friend of mine about doing some contact work. He referred me to a publishing service company who in turn offered to contract my editing and proofing services. Next, the morning of which I intended to tell my general manager I would be leaving, keep in mind at this point I was leaving without knowing if another position would arise; I was going over a few points with the owner of a radio network in regards to my new monthly radio show “Being” when I was inspired to ask if there were any openings in their sales department. She responded, “As a matter of fact we have a sales manager position open.” I had not even left my job yet and was blessed with two opportunities which both lined up perfectly with what I had prayed for. That is working smarter! I found out latter that the gentlemen who I was engaged with so deeply on the topic of God had submitted to another religion. Money was his God, doctors were his Pastors and prescription drugs would be his spirit within. He adamantly believed that the only way for him to be happy, stable and at ease in this world was through medication. Although he did make several good points about how many need to use medications to insure a balance of their body chemistry; he failed to examine the potential for diet, exercise and spiritual development to do the same. My mind is open on this subject and I am sure that medication has its place in the grand scheme of things. However, long term use always seems to create more long term problems and in most cases just covers up the root of the issue. If we fail to remove the root the weed will continue to grow, spread out over the field that is our lives and suffocate our Gifts within. 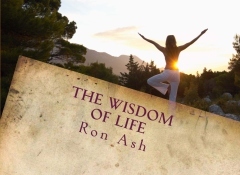 Listen to BEING with Ron Ash on demand by clicking this image.